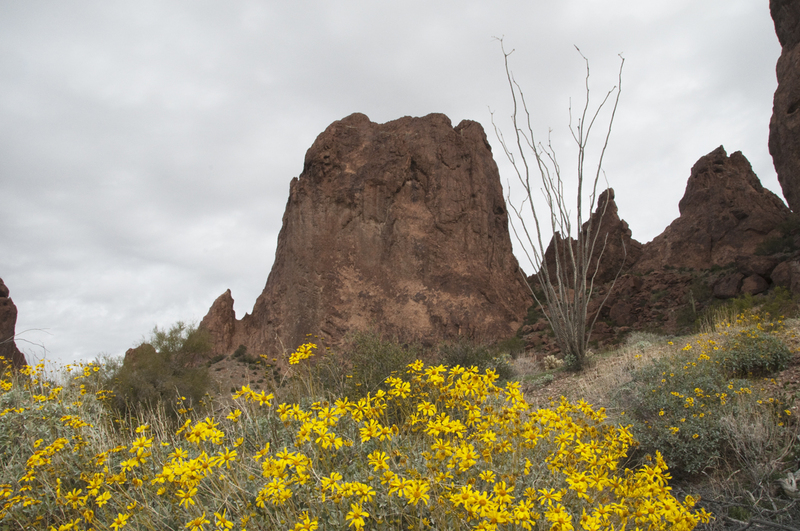 It's been 17 years since I ventured into Kofa National Wildlife Refuge. The last time we landed there after being driven out of El Golfo de Santa Clara by a parade of drunken Gringos on ATVs. We pulled onto a side road but woke up in a desert scarred by tank tracks and posted with "Danger! Unexploded Ordnance" signs. We packed up and ran. Of course after 20-some years in Arizona, bombing ranges co-occurring with wildlife preserves, strange lights in the night sky and 50-caliber cartridge shells no longer raise an eyebrow. 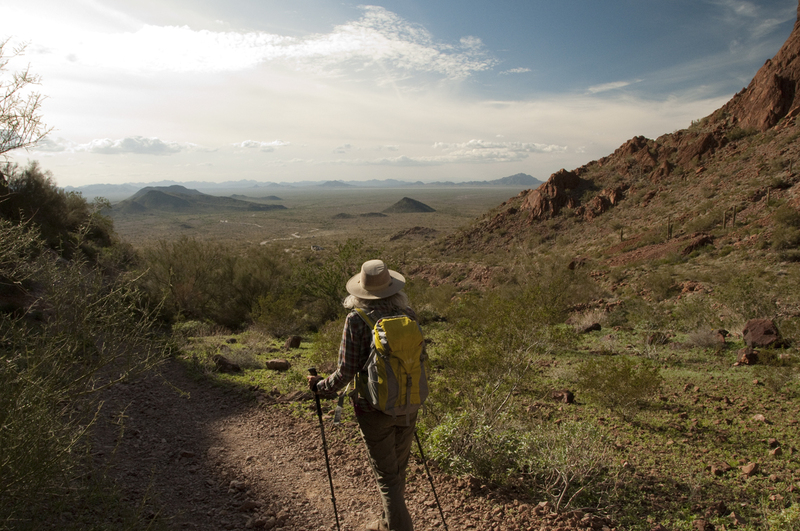 So we chose Kofa — so-named for the King of Arizona Mine — for a three-day winter expedition. 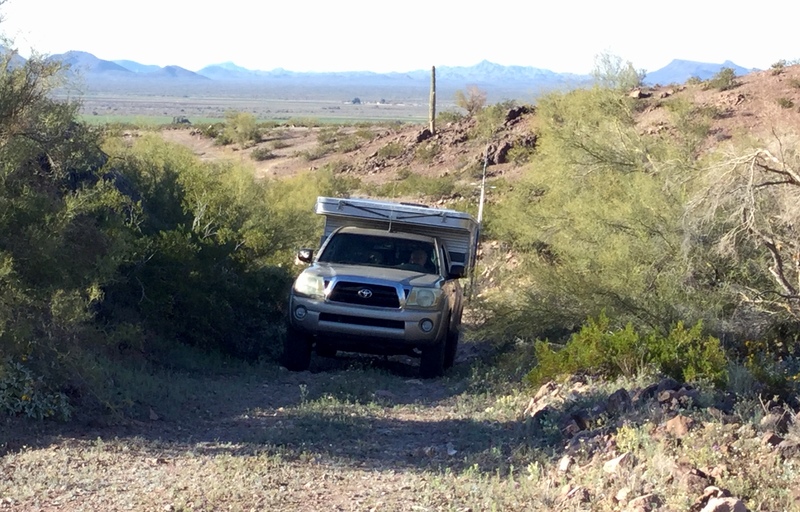 We left Tucson on a Thursday afternoon, aiming to camp at Painted Rock Campground, an area that piqued my curiosity because it appeared to be on the shore of a wide spot in the Gila River and named for a nearby petroglyph site. We were surprised to find the campground several miles south of the reservoir, and while most reviewers said the site was "lightly used", there were dozens of RVs spread out on a flat plain where ATVs were kicking up clouds of dust. We continued north to the reservoir, but despite our very wet winter, it was a dust bowl surrounded by eerily green fields, and the entrance was gated and locked. We fled onto BLM land, through the nearest open gate, and were fortunate to find a very nice campsite near some old prospects. There were even some early spring wildflowers, including this pale yellow lovely, which I took for an evening primrose, but which may actually be a desert sand star. And this deep blue phacelia. A couple of bars of internet gave us a chance to research the sad, sad story of the Painted Rock Reservoir, which was constructed during the nationwide dam-building frenzy of the 1950s, ostensibly to control flooding on the lower Gila River. The lake is named for a significant petroglyph site nearby. When the lake filled, it destroyed a Tohono O'odham community, shrinking its size from 10,000 to 40 acres. The Butterfield Trail also passes through the area. Through the 1990s, it was a popular spot for fishing, swimming and boating. However, during periods of high water, pesticides — especially DDT — washed in from upstream farmlands. In 2005, heavy runoff filled the reservoir to record levels, making it the second largest lake in Arizona. The extreme toxicity of the lake rendered it unsuitable for recreational use and both the lake and dam are now closed to public access. 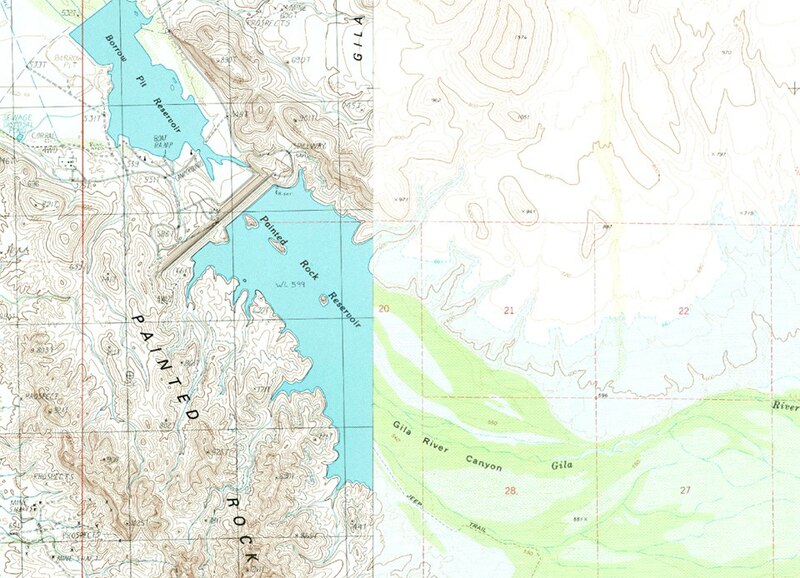 Topo maps obviously reflecting different periods in its history and the lake at high water in 2005. 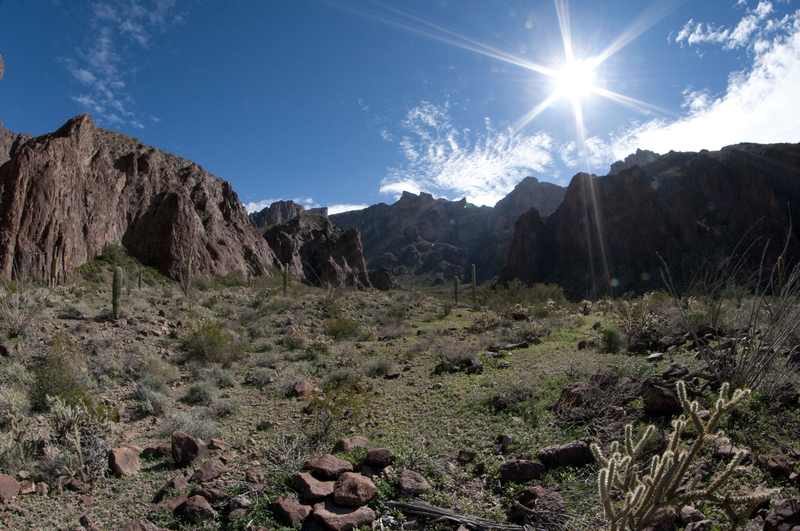 Of course we began with the obligatory short hike to Palm Canyon, the most popular site in Kofa NWR. 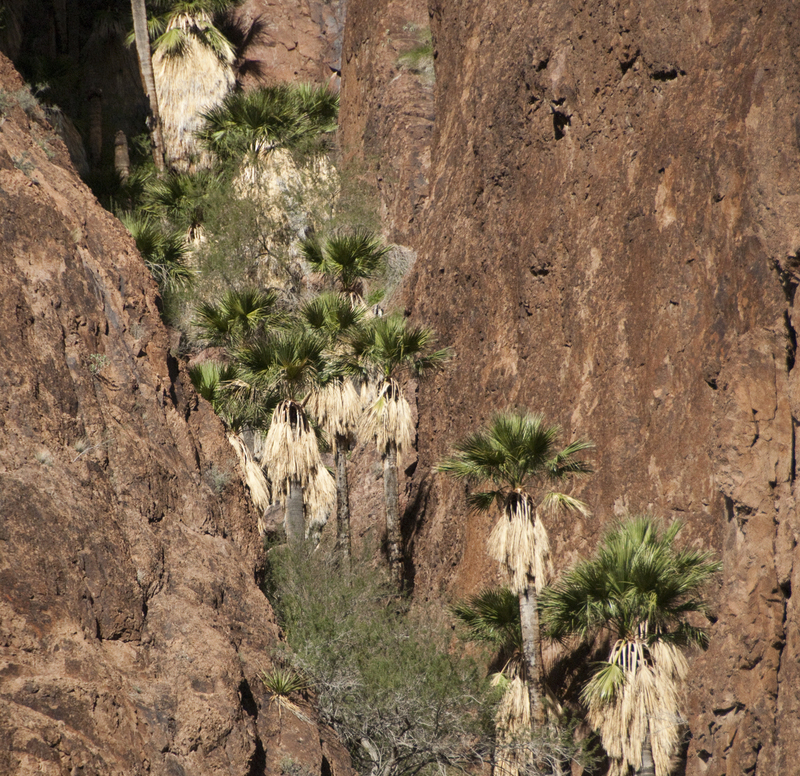 Tucked high in a narrow canyon is the only remaining stand of native California palms in Arizona. 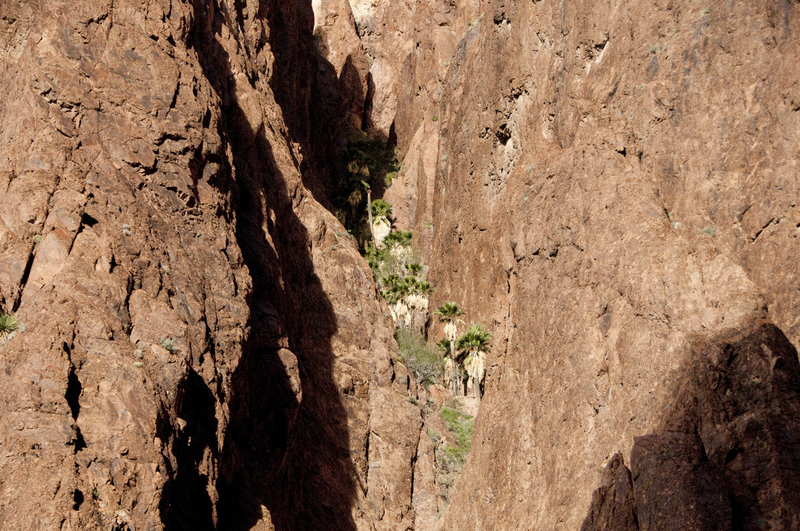 Hiking down out of Palm Canyon. There weren't a lot flowers there but these buckthorns added a lot of color. Fortunately we had done enough research to know that we should avoid camping along Palm Canyon Road, which was packed with RVs, some of them sporting Tea Party ("Don't Tread on Me") and Confederate flags. Yuck. 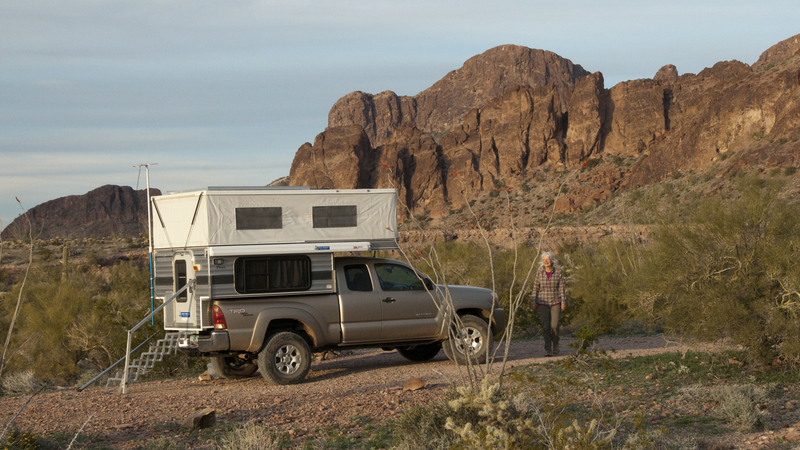 On a minor 4WD road we found a sweet, sweet campsite at the foot of the mountains and not another vehicle in sight. Hummingbird on an ocotillo branch. We were headed for Signal Peak, but the mountains near our campsite were so intriguing that we just bushwhacked from here. Blue phacelia and blackfoot daisy. Desert sand star (positive ID this time). Esteve's pincushion. That's a new one on me! The omnipresent brittlebush. It's easy to take them for granted because they're so common, but they are spectacular. Heading up a wash into Four Palms Canyon. The sighting of the day was three elk. Or were they just very large, very dark deer? I've read some accounts of "monster bucks" in the Kofas. 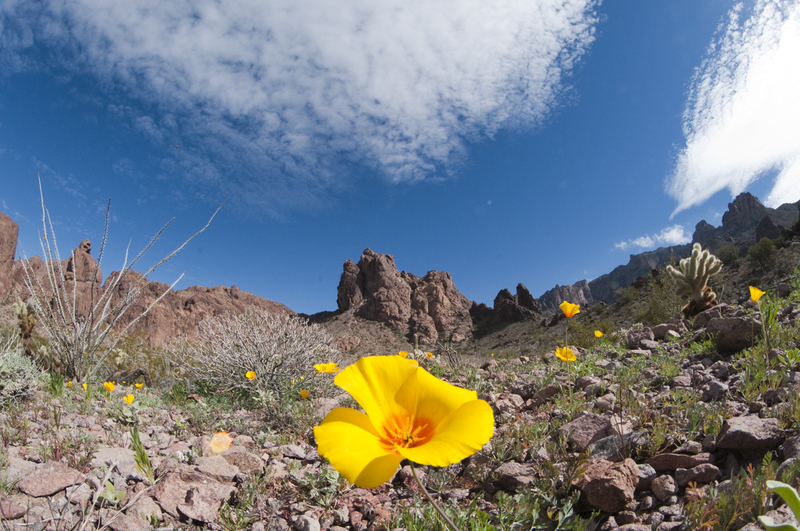 And a Mexican poppy. I swear these popped up while we were hiking! A huge storm moved in that evening, with wind gusts up to 35 mph that tossed our camper like a sailboat in a tropical storm. At dawn, we were awakened by two guys who pulled in and set up camp less than 20 feet from us (California plates of course). We packed up and headed for Crystal Hill, an authorized rockhounding area in the northwestern corner of the refuge. We only found a few crystals but it was a fun hike. 28 long slow miles in, we found Kofa Cabin, built by the CCC in 1939 using mostly Native American labor. 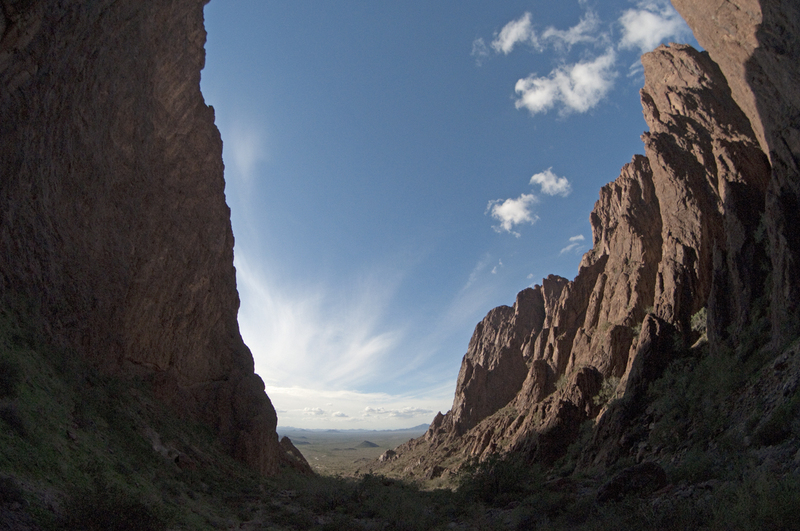 One thing we learned on this trip is that three days in Kofa is barely enough to nibble at the edges. 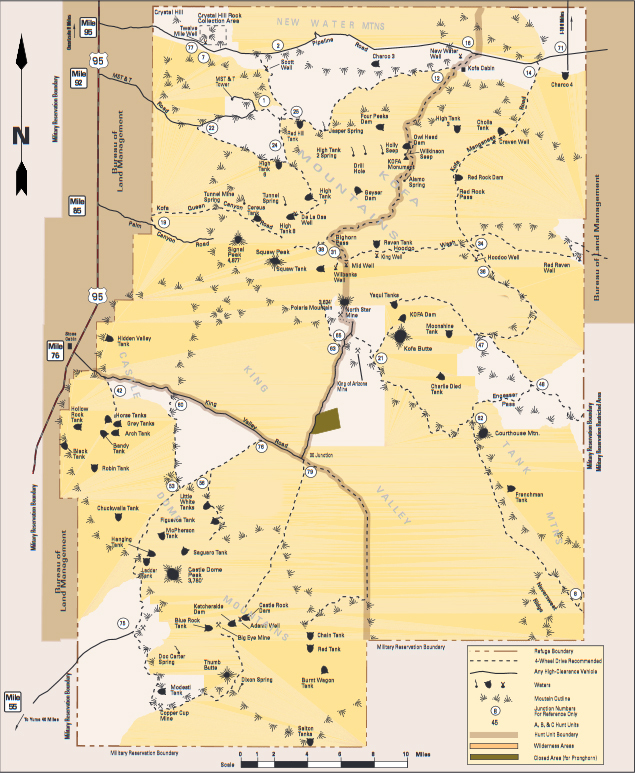 Unlike Organ Pipe, there are dozens of roads here, and you can drive, camp and hike on nearly all of them. But the distances are great and the going is very slow. It's first come, first served, if you want to spend the night, and it had an impressive stash of alcohol and a visitor log with hundreds of entries. Nice night out not far from the cabin. Isn't it good, Sonoran wood? 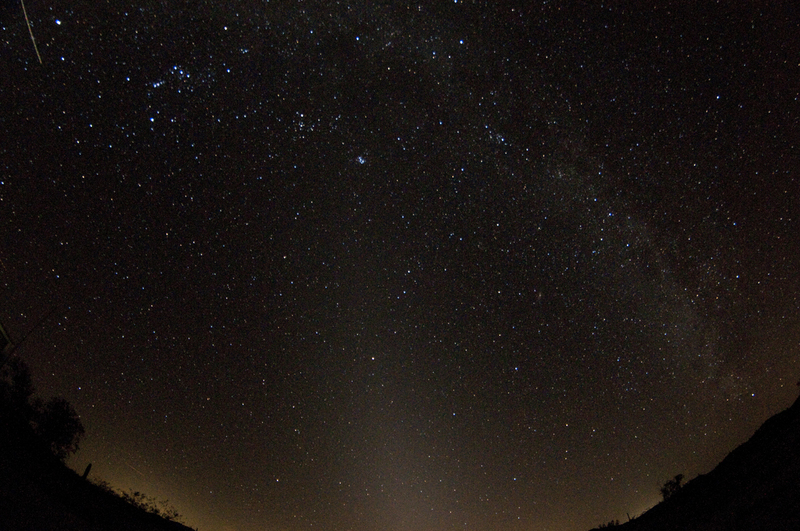 A night sky taken with a fisheye lens shows zodiacal light, the dust between the planets being lit by the sun when the earth is at the right angle. We've only observed this phenomenon a couple of times, since it requires a very dark sky. The lower left glow is Yuma and the one on the right is Quartzite.